I was born in 1960 in Northern Ireland. As a child I had a keen interest in painting and drawing and in the 1990s I decided to purposefully develop this interest. I took regular classes with a local art teacher in Southend, England and studied further at numerous weekend and week courses. 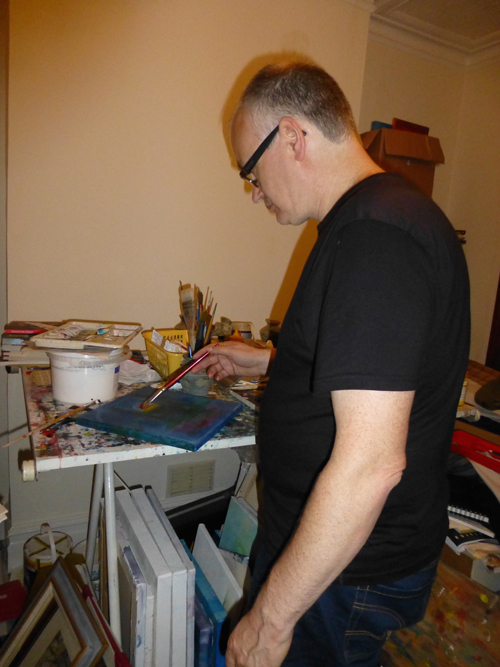 In 2007 I was able to work part time as an artist and took a studio space at Wimbledon Art Studios. I took part in their open studios for the 3 years that I was there and also, during that time, exhibited at the Brighton Fringe Festival and at Hicks Gallery Wimbledon. In addition I took part in a one week artists residency at Wymondham Abbey, Norfolk. During 2010 and 2011 I moved studios to a space in the London Bridge area of London and continued to take part in a number of exhibitions. I currently paint at home and have some work for sale online with an organisation called Veritasse. I paint using acrylics and oils. 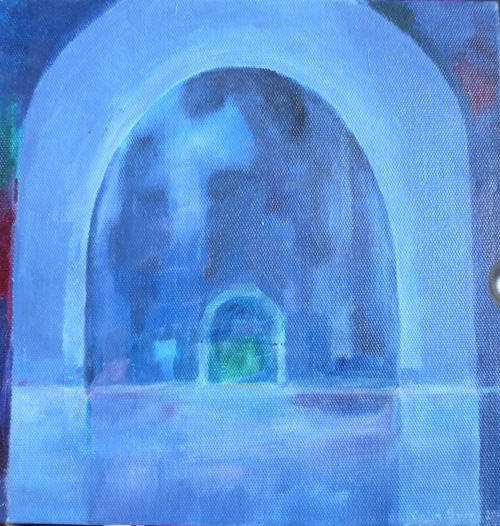 I see my paintings as an expression of my Christian faith and my own lifelong seeking after God. They reflect both my initial journey to find Him, and my subsequent desire to know Him more. Journeying into the unknown, a sense of adventure and discovery, hinting that there is something beyond the physical world that we can see - these are the themes that I am exploring in my work. I do so through representation and imagination. I am drawn to landscape painting - God’s creation speaks of him and points to him - though not all of my work falls into this category. My hope is that the viewer is drawn into the paintings and that they are touched by the unseen presence of the Holy Spirit. My acrylic paints are heavily influenced by the watercolour techniques such as those of Turner. In these I allow the paint to flow, creating unexpected moments of beauty. Eagle Rising, acrylic on canvas, 75 x 60 cm. This painting is based on Isaiah - 40.31 where waiting on the Lord leads to renewed strength and is compared to rising up on wings like eagles. The paint is left ‘unfinished’ and allowed to flow giving an upward sense of movement. White Horse, acrylic on canvas, 75 x 60 cm. 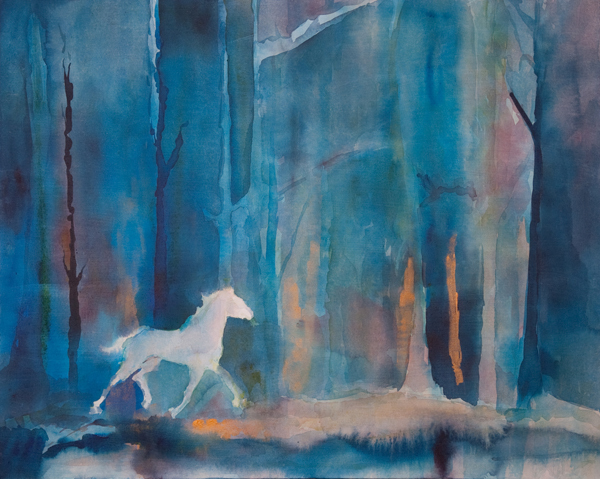 This painting is loosely based on Rev 19.11 which refers a white horse. The white horse in my mind represents pursuit, strength and determination; running the race and not giving up. Shrouded Secrets, acrylic on canvas, 40 x 40 cm. 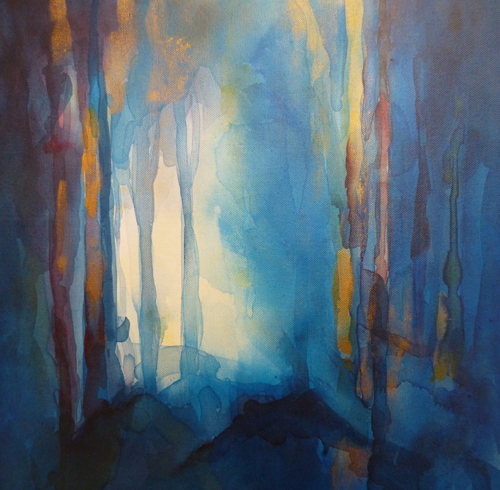 This painting of an abstract forest is meant to evoke a sense of mystery. There is something behind the veil. Light penetrates from the distance and the gold colour represents a sense of the divine. The painting is from imagination. Enter In, oil on canvas, 30 x 30 cm. An impression of coming into the presence of God - inspired by the throne room in Revelation. The image is painted from imagination. The cross shape just to left of centre represents and angel guarding the way into the presence of God. It is deliberately shaped like this to allude to Christ's work on the cross.